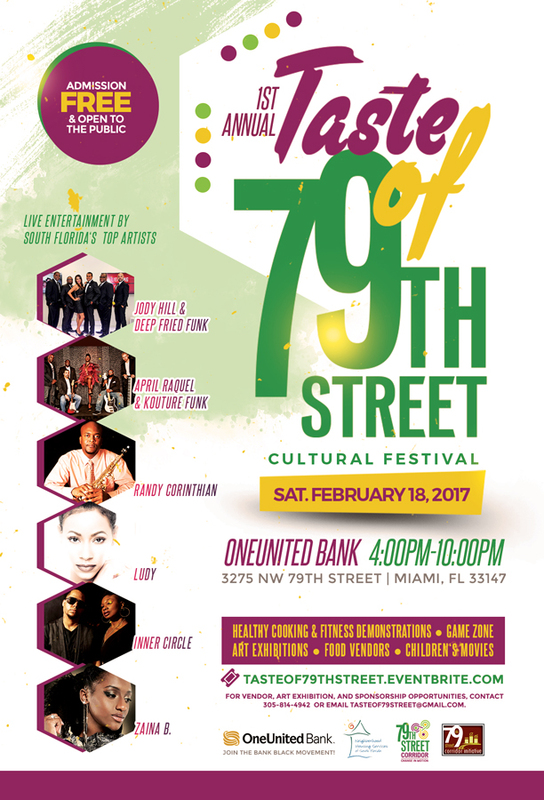 MIAMI, FL – The 79TH Street Corridor Initiative proudly announces the 1st Annual “A Taste of 79th Street” Cultural Festival. The festival celebrates the rich culture surrounding 79th Street and promises to stimulate economic development within the community. The event will be held on Saturday, February 18, 2017 from 4:00pm – 10:00pm at OneUnited Bank, located at 3275 NW 79th Street Miami, FL 33147. 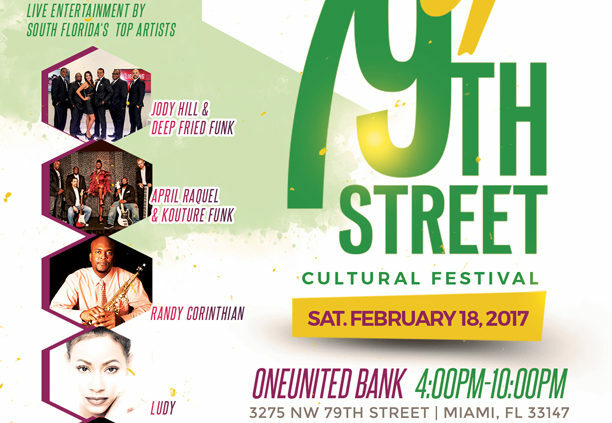 A Taste of 79th Street will feature live performances by some of South Florida’s top bands and performers including Jody Hill & Deep Fried Funk, April Raquel & Kouture Funk, Saxophonist Randy Corinthian, R&B artists Ludy and Zaina B and Gospel Duo Inner Light. In addition, there will be a kids zone complete with movies, games and attractions for children of all ages, local food vendors and retailers, community resources, and an art exhibit. One of the main attractions are the healthy cooking and fitness demonstrations which is aimed at educating and creating greater awareness about the importance of good health and wellness practices. The 79th Street Corridor Neighborhood Initiative looks to attract over 1,000 attendees in this inaugural year. “We’re excited about our first 79th Street cultural arts festival. We believe this event is needed and will not only bring the community together for family fun, but will help stimulate the local economy by giving attendees a taste of what our businesses, organizations and vendors have to offer the entire North Central community.” says Ron Butler, Executive Director of the 79th Street Corridor Neighborhood Initiative.